Carrot is a root vegetable that originated most likely from wild ancestors in the regions of Afghanistan and Iran. Carrots are currently enjoyed most for their taproot with is sweet and crisp when fresh and raw, though their greens are also very edible and nutritious. Hundreds of varieties of carrots exist – ranging in size, shape and color (orange, red, yellow, purple and even white). Carrots are perhaps best known nutritionally for the high amount of the antioxidant that bears a resemblance to its name: beta-carotene. 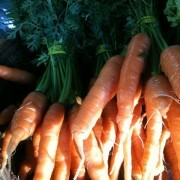 – Always wash your carrots and peel them (unless organically grown) before eating or prepping for cooking. – Contrary to popular belief, cooked carrots are more nutritious then raw. Pulping or steaming a carrot will improve the amount of betacarotene that is digested to 39%, as opposed to 3% that is absorbed by a raw carrot. – Carrots can be juiced, stir fried, steamed, baked, roasted, used in soups and pickled. Look for firm carrots that are bright in color. The deeper the orange, the higher the beta-carotene in the carrot. Avoid soft, rubbery, cracked or forked carrots. The sugars are concentrated in the carrots’ core, it is thought that those with larger diameters will have a larger core and will therefore be sweeter. If the green tops are still attached, they should be dark green and feathery. Store carrots unwashed and wrapped in plastic bag in the coolest part of the refrigerator. Carrots can keep well up to two weeks, but the key is to reduce moisture, especially the amount of condensation that can form on the carrots. You may want to wrap in paper towel and then wrap in plastic bag if you notice your carrots getting moist. Carrots should also be stored away from potatoes, apples, pears,and other fruits and vegetables that produce ethylene gas as this will cause them to become bitter. If your carrot have green tops, best to cut off the greens off before storing in the refrigerator or the carrots to wilt prematurely as they will pull moisture from the roots. Carrot greens should be used soon as they are fragile. If you need to store, keep them moist by wrapping in a damp paper then plastic bag for a few days. Though we now know carrots and grow them to eat their long sweet taproot, originally, carrots were grown for their leaves and their seed. Carrot seeds have been found in archeological digs in Switzerland dating to 3000 B.C. It is thought that carrot seeds were used along the same lines as the seeds of their relatives – cumin, dill, parsley, and fennel.